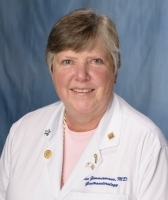 Ellen Zimmerman, M.D., Professor Department of Medicine and Vice Chair of Academic Affairs has been selected as a Fellow in the 2017-2018 Class of the Hedwig van Ameringen Executive Leadership in Academic Medicine (ELAM) Program for Women. She joins Dr. Tara Sabo-Attwood as one of two UF faculty selected for participation in the 2017-18 ELAM class. The Hedwig van Ameringen Executive Leadership in Academic Medicine® (ELAM®) is a year-long part-time fellowship for women faculty in schools of medicine, dentistry and public health. The program is dedicated to developing the professional and personal skills required to lead and manage in today’s complex health care environment, with special attention to the unique challenges facing women in leadership positions. The 2017-2018 ELAM Class reflects an exciting diversity in many categories, including discipline, ethnicity, age, and geography. Each class works together to identify ways they can play leadership roles in the future as academic health centers change in response to today’s societal, technological, and market forces and a desire to play a leadership role in guiding this process.